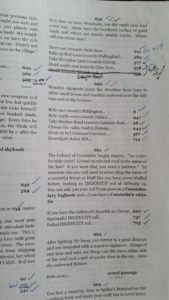 A short while ago I was asked by fellow gamebook enthusiast Lloyd of Gamebooks whether I would be attending Gamesfest or Dragonmeet this year… And after a little rustling around, it looks like I’ll be at both! 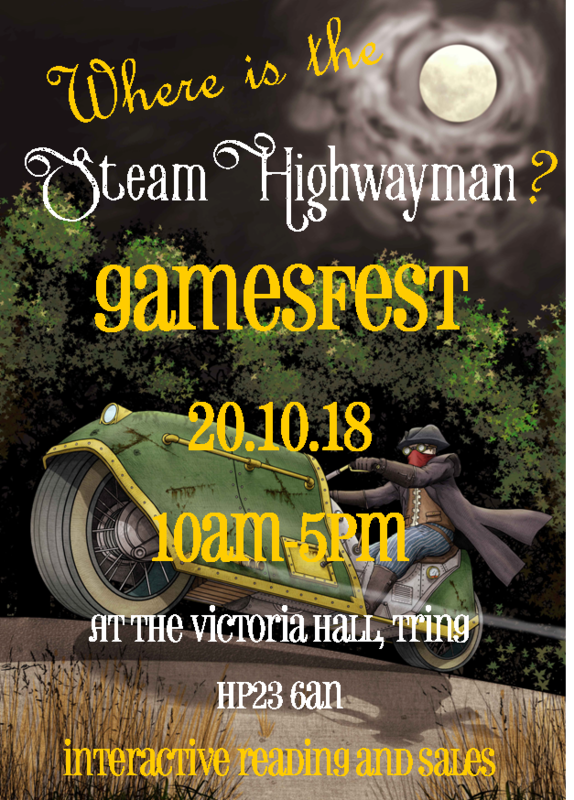 I’m keen to share Steam Highwayman with game enthusiasts as well as steampunk, so friendly and welcoming events like these seem just the place. I have been organising and hope to perform an interactive reading at Gamesfest, so if you’ll be attending, please let me know so that I can include you! I’ll also be posting a write-up here in a couple of weeks. If there’s an event you know of – particularly during November – that you think would be improved by the sudden and terrifying appearance of the Steam Highwayman, please suggest away! I had a great day in great company at the Maldon Museum of Power yesterday at the fourth Steampunk Essextraordinaire! 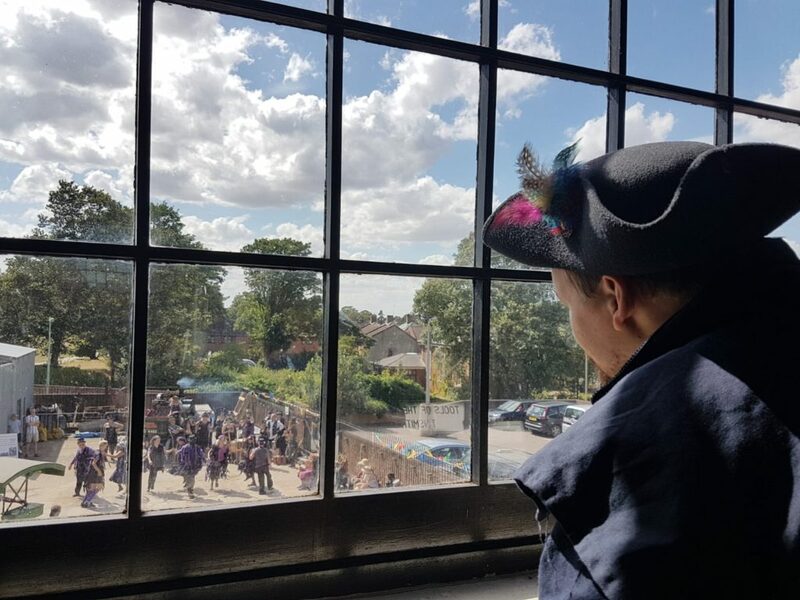 Hosted by Paul Adams and the League of Essextraordinary Gentlemen, I had the privilege of sharing my work alongside other steampunk authors, performing an interactive reading and spreading the legend of the Steam Highwayman even further afield. 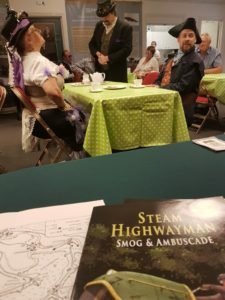 This was a special day for me because exactly a year ago I attended the Essextraordinaire III in faith, with Steam Highwayman I: Smog and Ambuscade still crowdfunding on Kickstarter. Without any book to hand I was invited onto the writer’s panel alongside Toby Frost and Jon Green and had the chance to tell everyone about the project. To return with the book itself – and the promise of a second to come – has given a massive boost to my confidence and self-belief. 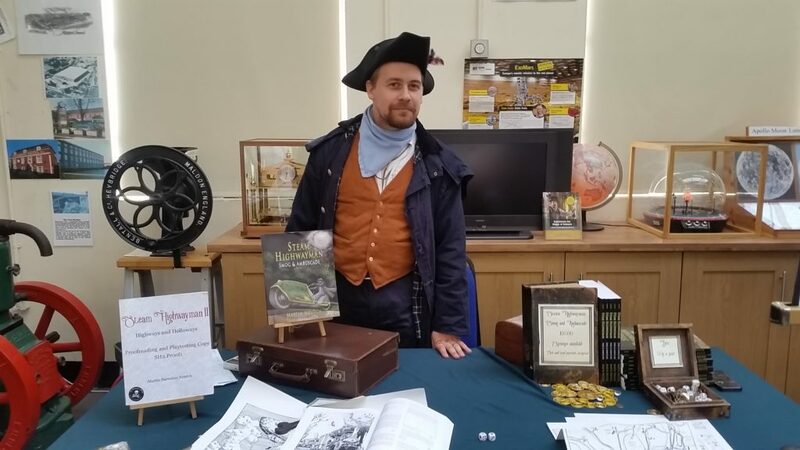 The event reminded me how much I enjoy reading from Steam Highwayman and how well it influences my sales at any event. Honestly I’d say that despite the small audience, I gave one of my most engaging performances – but then the bar was very high, with Helen Bruce of Solstice Storytelling telling her steampunk’d traditional tales and Darren Gooding performing his excellent verse and one-man, three-charactered theatrical extracts. So I’m fairly confident that I’ll be back in Maldon next September – and already looking forward to it. How many books will I have on the stall by then? 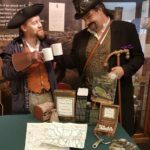 The Return of Steam Highwayman FUNDED! So that’s good news! I’m particularly pleased that in the final day of the project, so many of my previous backers returned to pledge for the sequel to Smog and Ambuscade. This means that 100 of the 186 backers of my previous campaign have returned – a figure to be proud of – but also that I have reached 125 new backers since then. Wow! 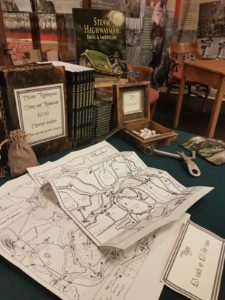 The total copies of Steam Highwayman gamebooks printed until now number fewer than 300, so by fulfilling these pledges, I’ll be more than doubling the presence of Steam Highwayman on shelves and coffee tables across the world. We’ve also seen backers from around the world playing a significant part. Australians made a particularly big contribution this time, with 11 backers pledging – 8 of whom are new to the project. At this rate I’ll expect to see a dusty Ferguson velosteam cosplayer in the outback any time now. I’ll also be continuing to be promoting my books in person at Steampunk events through the autumn. Watch out here to find out what, where and when – and you can even choose to subscribe to my blog if you’d like to be sure you don’t miss out. Should be something over there on the right on the sidebar. So I’d like to express my gratitude to all of my backers and supporters. Your interest, your pledges and your comments all the way through the project make it possible for me to keep going – I’m a words of affirmation sort of person, as my wife will tell you. So let me encourage you! If you’re considering publishing a book or crowdfunding a passion project, don’t wait for it to be perfect or finished or even totally ready. It’s simpler than it looks and once people get an idea of why you’re excited about it, they seem to get behind you. 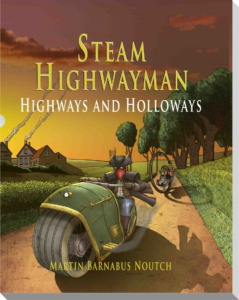 After all, who is the Steam Highwayman? YOU are the Steam Highwayman! Anyway, there’s been some great interaction over on the campaign in the last few hours, with new backers joining overnight, particularly from the US, Europe and Australia. I’ve updated a few FAQs – because they’ve been asked once or twice, rather than frequently – and added more keen backers to a provisional proof-reading list. Thanks to everyone who’s stayed with the campaign – particularly the 90 or so repeat backers who came with me from SH1 and the first-day crowd. That’s been really encouraging. I’ve got a busy day ahead of me, but expect an update tomorrow night on KS and here as well. In two days time my second Kickstarter Campaign will be complete – and fully funded! In fact, the campaign is currently at 137% and more backers are still trickling in. Where will it all end? The temptation to over-edit has to be fought. I’ve re-arranged one knot of roads, simplifying it to make navigation quicker and more straightforward. This was one of the few criticisms about Smog and Ambuscade and, honestly, one I can completely understand. One of the tricky things is that, having created the maps, ridden the roads and spent months writing the adventures, I can no longer trust myself as a standard of reading the navigation. I know exactly where places are and have, like a homing pigeon, a certain sense of direction, no matter what passage I am reading… So I’ll be relying on my playtesters in the next weeks to help me with this. Tick, tick, tick, tick, scratch, flip, tick, turn, tick, flip, double-check. Why on earth did I allow the book to reach 1500 passages? Immediately after the end of the campaign I’ll be heading to a meeting with Ben to make a full plan for the illustrations, and after that will come my backers’ chance to have a say in what gets drawn. So, expect several more posts in the next few days! Three days to go on Steam Highwayman II Kickstarter! The campaign is almost complete and has been a great development from last year’s campaign. As I wrote previously, the project has now moved on to be mainly supported by readers and would-be-readers of the gamebook. I still count a few faithful friends and family members amongst the 188 backers to date, but in fact I’m now making new friends through the readers of Steam Highwayman. Gamebook collectors and enthusiasts like Ben Roberts, who seems to have developed a strange idea that the Steam Highwayman is really a gourmet in search of the perfect pork pie, and Stuart Lloyd, a critic, writer and fellow tutor who always provokes me to think about the boundaries between learning and play. 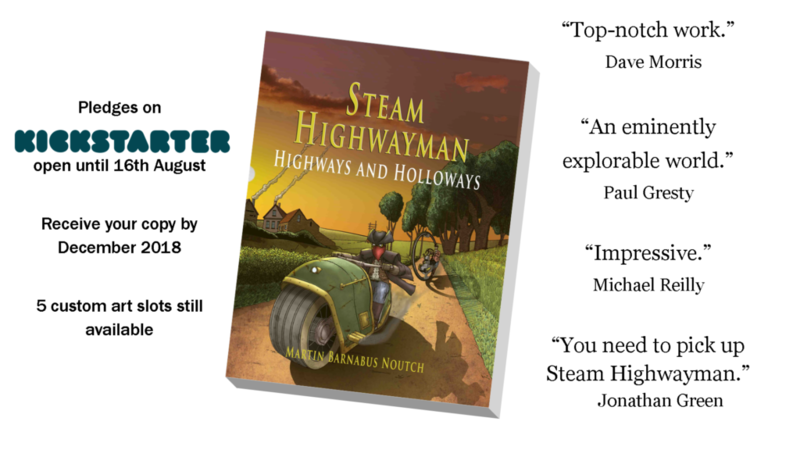 Then there’s Dave Morris, who twelve months ago was a distant and admired hero, but has now become a faithful supporter of the Steam Highwayman project, and Jon Ingold, whose 80 Days did so much to inspire me to get on and produce a text adventure. At the Suffolk Steampunk Spectacular, hosted by the Long Shop Museum at Leiston, I was greeted by Dean Allen Jones, already familiar with my work and keen to buy another copy, having given his first away to a hungry nephew. I did try creating a scattergraph which correlated repeat backer’s SH2 campaign backer number with their SH1 campaign backer number, just to see what sort of result I’d get. Mark Lain managed to bag spot number 5 both times, which I know tickled us both, but otherwise there was no sort of pattern at all. But that’s why you whack data into a graph, isn’t it? To interpret bare facts into something for those visual processors we have. I’ve always been a thinking-by-drawing sort of person – making maps, plans and designs was my idea of fun from childhood and if I could get away with doing it full time, you bet I would. Something fabulous has been happening over on Kickstarter… My first publishing and gamebook project last year raised around £4700, partly thanks to the generosity of friends and family who wanted to see my work in print and several of whom gave far more than the suggested pledge. In all, 189 supporters joined the project. But this time, things have been different. Around 85 of last year’s backers have returned to order the sequel and almost a hundred new backers have joined in – and with a far smaller number of family and friends, the project has now raised more than £5100 towards the publication. This is very exciting for me as the project is really standing on its own merits now, appealing to readers on account of the recommendations of genuinely-interested advocates (which is why I prepared the new image above) and on the strength of Book I’s reputation. This bodes really well for the ongoing project. With each volume I write, there will be an increasing number of readers who return to see the next book published – I hope – and the work will increasingly do its own publicity… Every now and then when I discover a mention of Steam Highwayman out in the wilds of the internet, my heart skips, like when I saw it on the front page of Demian Katz’s gamebooks.org – and if you haven’t visited that amazing labyrinth of dreams, head over there and find out about all the gamebooks you haven’t bought or read yet! Demian is a librarian (I believe) and a backer of book 1 and has a lot to share with you about the workings of choice-based fiction. 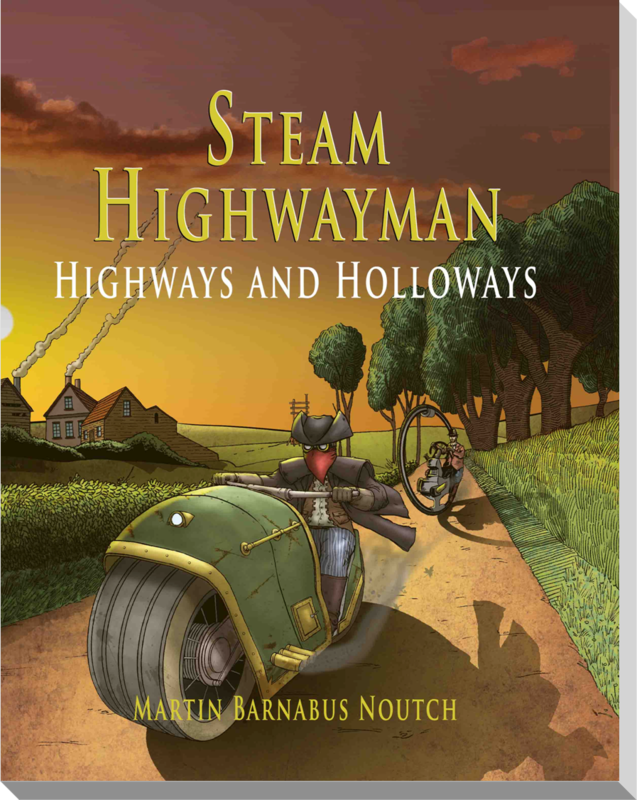 It’s a great day here at Steam Highwayman tower: fully funded this afternoon and Ben delivered a finished cover too. I’m really pleased with his work and very proud to be able to share it with my kickstarter backers. It’s been a complex cycle of brief, editing and work-through, but I reflected earlier that without Ben, my own image of the Steam Highwayman, as well as the look of the whole project, would be entirely different. I’m so grateful to be able to inject a fresh look into Steampunk by partnering with him, as well as receiving these excellent book covers that turn heads wherever they’re seen! This is quite a turning point: as I update the Kickstarter campaign and Facebook pages, I hope that this cover will attract brand new readers, backers and fans. I mean, you shouldn’t judge a book by its cover – but we all do, and if it’s one of Ben’s, why worry? Yep – that’s right. 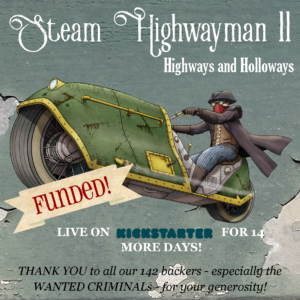 Steam Highwayman II: Highways and Holloways is now fully funded on Kickstarter. It’s particularly to do with the generosity of four backers who have chosen to pledge to be drawn into the book as Wanted Criminals – watch out for these dangerous people and their wanted posters! But of course, those four wouldn’t have been able to fund the thing entirely – I’m grateful to the 138 others – and families – who have chosen to pledge and contribute to the project. In the meantime, I’ve been editing and working on smoothing out the playthrough. This morning, though, I woke up with an idea and began sorting out some of the planning and links for SH3… Perhaps that was a good way to be thinking! There’ll be news soon about the cover and other illustrations, but for now, good news and thankyou! Where is the Steam Highwayman? Well, the Steam Highwayman’s back at home beside the Thames in the industrial East End of London, actually, but this Saturday I visited the Long Shop Museum at Leiston for the Suffolk Steampunk Spectacular – and had a great time with two interactive readings, a nerve-wracking tea duel, sales of Smog and Ambuscade and some down time exploring this fascinating museum! Leiston has never been on my map, but I know that I’ll certainly be returning – for the museum and more besides. The Long Shop is a fascinating early factory – a preserved and partly-restored portion of the once-massive Garret works, which dominated the small county town. In the 1780s, agricultural machinery was built here – in the 1800s, traction engines and ironwork. In WWI, this was the ‘factory nearest Germany’, as well as the root of a hospital founded by the Garret family, a significant number of recruits for the war effort and much more beside. 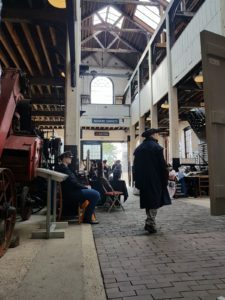 The museum is a showcase of the rural foundation of the industrial revolution and also reveals how innovative traditions rooted in local communities have influenced the very underpinnings of our modern world. Families from Leiston, whose expertise in engineering built the beautiful steam traction engines on show, contributed to the construction of Sizewell nuclear power station, just a few miles away on the coast. Our trip to Leiston was through the torrential rain of the summer storm that broke the hottest month for years. 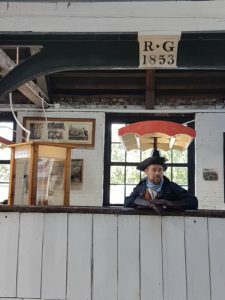 It felt very exciting – and inspiring – to be exploring more of historic England on the road at the mercy of the weather – and prompted me to think and reconsider exactly how weather-dependent travel in the age of steam would have been. Perhaps this will play into some future iterations of Steam Highwayman? An interesting discussion with a Steampunk at the stall about cattle drovers – their coats, roads and traditions – might play into this. We set up inside the teashop and laid out our stall, including, for the first time, large digital prints of Ben’s illustrations for Smog and Ambuscade. I think these look really smart and, sold in cardboard tubes, they slipped into my shopping bags really nicely. The day was hosted by Dean Allen Jones of Nothing Up Our Sleeves magic – and he did a fantastic job of involving newcomers, hyping my reading and keeping the day running to (Steampunk) time. Two traction engines were in steam – including a unique Suffolk Punch, built here on site – and a unique little tank engine, called the Sirapite, that had once been part of the MacAlpine collection. Morris-dancing from an as-yet-unidentified group took place and there were a few other stall-holders too – including one offering interesting steampunk soft toys! I participated in a really hand-shakingly nervous tea duel with a mysterious lady in lilac, but some dastardly play prevented the Steam Highwayman from demonstrating the inevitability of the revolution of the proletariat. Still, this was my favourite duel yet and my wife Cheryl’s first experience of watching it. If you haven’t ever made your way to the Leiston Long Shop but you’re interested in the rural roots of the industrial revolution, this place is a must. The long shop itself – a galleried workshop – has a fascinating architectural structure with a hybrid wooden and iron frame. Exhibits of machinery on the ground and tools and displays on the galleries are well-labelled and engaging – and there’s even some hands-on stuff too. 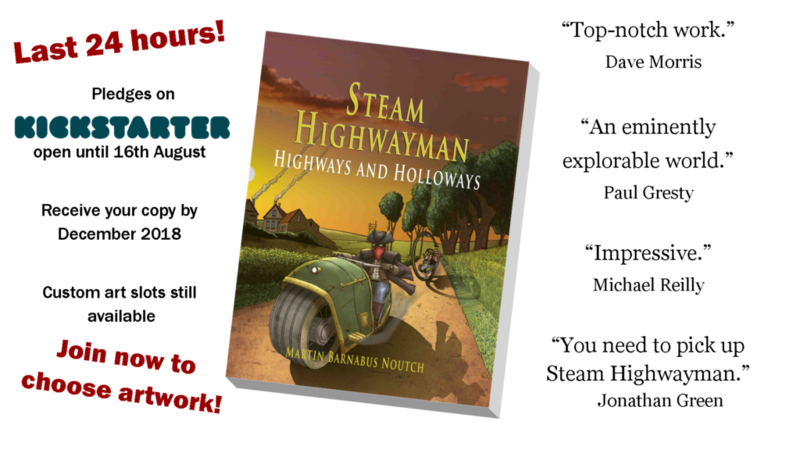 While there I also continued to promote the Steam Highwayman: Highways and Holloways Kickstarter and found myself at least one new backer from the participants. As I write, we’re at 83% and only looking for another 25 or so backers to fund the project fully. It’ll be great to be sending out copies with a touch of Leiston in them – either in the illustration or in the edited adventures. In the afternoon I read from Volume II for the first time and was gratified to find the audience just as engaged – and just as keen to rob and steal in the name of adventure. Where is the Steam Highwayman headed next? Well, subscribe to my blog here or follow me on Facebook as I organise the next events over the summer season. I can confidently say that I’ll be attending the Essextraordinaire at Maldon Museum of Power in September but aIso hope to be out reading and publicising before then. 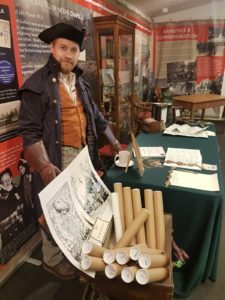 If you’ve an event and you think a Steampunk Highwayman with interactive readings and book signings could add to it, let me know and I’ll descend like the night – sudden and unstoppable! If you’ve enjoyed seeing some of the photos here, I’m sharing an album of photos from the day on Facebook too.